To most North Americans, it probably seems odd that a "Wildlife" publishing company would produce a book about fungi. But, as I learned a few years back, it isn't so odd at all when you consider that the British meaning of "wildlife" is far broader than ours. It encompasses nature in general, not just the larger animals. 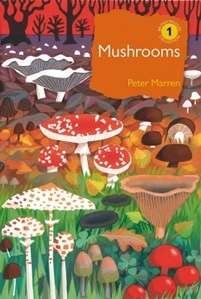 Peter Marren is an amateur mycologist who, for many years, has written articles about mushrooms for the magazine, British Wildlife. Thus, he was a logical choice to author this first volume in a new series of books on various aspects of natural history and conservation (the second volume concerns meadows). The 13 chapter titles provide a sense of the coverage: A fungal autobiography (in which Marren presents his mycological credentials), Meet the mushrooms (the basics of what fungi are and what they do), What's in a name? (an extensive look at both common and scientific names), Mushrooms on parade (a brief summary of the different types of mushrooms), What mushroom is that? (identification issues), Natural habitats, In our midst: our fungal neighbours (closer-to-home habitats for mushrooms), Earthtongues, waxcaps, and hedgehogs: what fungi tell us about the natural environment, Scarcity and plenty: why some mushrooms are common and others are rare, Forays amongst the funguses, The good, the bad, and the crazy (edibility, toxicity, and magic mushrooms), Picking for the pot, and Saving mushrooms. The text concludes with a fairly extensive list of references and suggested readings and a general index. Marren's writing is clear, approachable, and makes for an enjoyable read. The text is profusely illustrated with beautiful photographs (mostly of mushrooms, but also of people) and other attractive images such as book covers and even a charming menu for a banquet that followed a 19th century foray amongst the funguses sponsored by the Woolhope Naturalists' Field Club of Herefordshire (apparently the folks who first used "foray" to describe a hunt for mushrooms). My only complaint is that the book suffers from far too many over-generalizations and misstatements of fact, including nearly everything that is said about mushrooms and mushrooming in North America. Some examples: Hebeloma radicosum is said to have a long taproot that penetrates underground nests of mice or other animals, but that isn't how mushrooms grow. The fungus's mycelium is living within the nest and the mushroom grows upward from the mycelium to the soil surface not down into the nest. Marren considers David Arora's common name for Lepiota naucina (Leucoagaricus leucothites) — "woman-on-a-motorbike" — one of the best, allegedly reflecting a mushroom with "long, shaggy 'hair' falling from a crash-helmet-like boss (umbo)," and he laments that the species is "non-British." But the mushroom in fact has no long hair—the cap actually is rather smooth or faintly scaly — and a quick check of some British field guides shows that it is considered widespread and common there, where its common name is "white dapperling." The genus name, "Lacrymaria," means "having tears," not "Mary's tears," thus negating a possible biblical reference. The "leuco" in the genus name, "Leucocoprinus," refers to the species having white spores, not to the mushrooms being white inkcaps. In many places certain mushroom fungi are said to be unrelated to others. But ALL mushrooms and, in fact, all organisms are related — it's just a matter of greater or lesser degree. Sarcodon imbricatus and S. squamosus are two different (though often confused) species, not former and current names for the same species. In making a case against regulation of mushroom-picking, Marren far overstates the existence of field experimental evidence suggesting picking does not lead to long-term decline in mushroom fruiting. Although, for me, the occurrence of such things detracts botheringly from what otherwise is a fine presentation, it is unlikely that most readers would be affected to nearly the same degree. Thus, I think mushroom hunters in North America would enjoy this book and appreciate getting a sense for the similarities and differences between amateur mycology in our two different parts of the world and so I recommend it — just don't believe everything you read in it. This review was published in the March-April 2014 issue of The Mycophile.